A new study suggests climate change could pose trouble for picturesque Walden Pond and one way to stave it off could be asking swimmers to resist the urge to urinate, which provides nutrients to microorganisms that can choke the pond. It will be “prudent to further reduce the flow of anthropogenic nutrients to Walden Pond under the warmer, wetter conditions that most climate models project for New England during the 21st century,” said the study, which was published in the journal PLOS One. The study suggested that swimmers be asked to refrain from urinating in the pond and that perhaps a swimming pool could be constructed as an alternative swimming spot. “Swimmers are probably the largest source of such nutrients now, and demand for the beach facilities is likely to increase in a warmer future. Swimmer-education programs or construction of a separate swimming pool facility nearby to relieve pressure on the lake might therefore be advisable,” the study said. Curt Stager, a professor of natural sciences at Paul Smith’s College in Paul Smiths, N.Y., who led the research, said even tougher measures, such as banning swimming, would be even better, to keep the pond from becoming murky. “That would be ideal for the sake of the lake. I think it would be a tough sell for the public,” he said, noting that people love to swim there and, for some, it’s a family tradition. 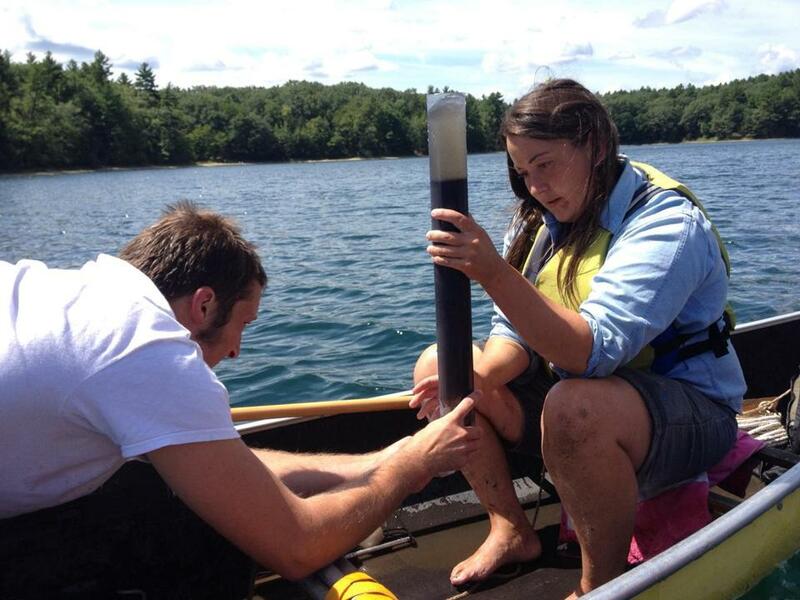 Two Paul Smith’s College students work with a core sample of pond sediment. As the climate changes, the water is expected to get warmer, which will favor algae that make the water murkier. The warmth also helps more phosphorus, a key nutrient for the algae, escape from the sediment at the bottom, he said. “Phosphorus is a fertilizer. You put it on a crop, the crop grows better. . . . You put it in a lake, the algae grow better,” he said. The other problem with the warmer temperatures is that it will lure more people seeking relief from the heat to the pond, “and a certain percentage of them pee,” he said. Previous studies have found that half the phosphorus in the lake in the summer comes from human urine. Although the warming can’t be stopped, people’s behavior can be changed. “It’s controlling what you can,” he said. Researchers took core samples of the sediment at the bottom of the pond to follow up on a study done 20 years ago. Stager said researchers wanted to see if the efforts of the Department of Conservation and Recreation have been successful in stabilizing the water quality. This microorganism, Discostella stelligera, has become less common as the pond has become murkier. “The good news is it’s been holding steady. The scary part is they’re going to have to work harder to keep it that way” because of climate change, he said. The research, which was funded by a grant from the National Science Foundation, also looked at sediments deposited as far back as 1,800 years ago to see what effect past climate changes had on the lake and “anticipate what the future might hold,” he said. The 64-acre pond in Concord was immortalized by Henry David Thoreau, who wrote about communing with nature and himself in his book “Walden.” Thoreau is considered a forefather of the American environmental movement. Contact Martin Finucane at martin.finucane@globe.com.